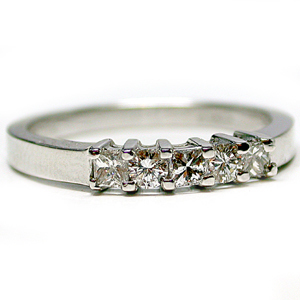 Three princess-cut and two round brilliant-cut diamonds are set in this lovely 14 karat white gold ring. The 5 diamonds total 0.60 carat and are graded F/G color-SI1/SI2 clarity. The ring is channel-style with mutual prong-set stones. Stock size,6.